Spring is springing nice and early this year. It already feels like May — highs in the 70s and lows in the 50s. We’re starting to turn over the dirt in the raised beds, and even move them a little bit. They were too far in the shade last year and a bush has grown tall enough this year to shade them even more. A really handy thing to do (especially if you’re a little crazy about calendars like I am) is to make a nice detailed chart of when you need to start seeds, transplant, plant seeds directly, and expect your harvest. Better Hen’s and Gardens blog posted theirs, including a nice template you could easily adjust to use on your own. My planting schedule is still being somewhat developed, but it’s shared in Google Docs for anyone to peek at anytime they want to. 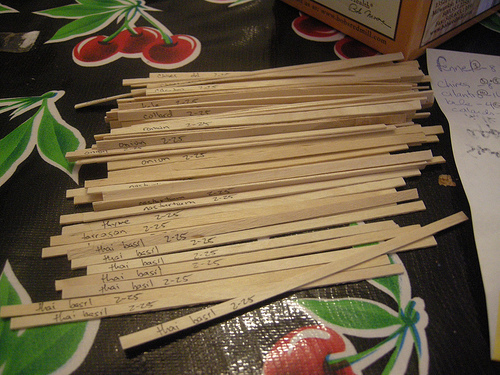 I still need to plant this week’s seeds, but it shouldn’t take too long. The bulk of the early seeds were planted the past couple of weeks. The seeds from last year are all still germinating quite well, which makes me happy. I’m using some of the things I liked best from last year, like the lettuce, celery, and thai basil. I’m trying all different tomatoes and squash and beans, since I wasn’t so thrilled with ours. I’m also giving up on melons — it uses up a lot of space and they mostly got end rot and gnawed by rodents. Some new plants this year are corn (planted Three Sisters style with all new squash and beans), an extensive supply of herbs (last year I left them in the sunroom and they all burnt to a crisp), two types of beets, potatoes and sweet potatoes, and fennel. I love fennel. I’m hoping it will grow as well as the celery did last year. 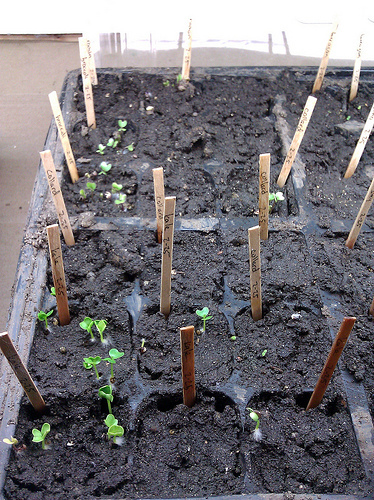 I’m still planting broccoli and kale and collard greens, hoping we’ll have enough spring this year for them to do well.